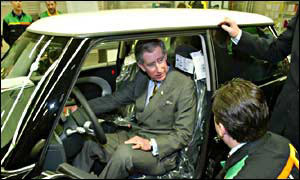 Prince Charles surprised workers at an Oxfordshire car factory when he got behind the wheel of a new Mini. He was expected only to tour the Mini plant at Cowley, but got behind the wheel of the car and drove it off the end of the production line. More than 700 new jobs were created when owners BMW invested £230m in the plant, which has recently produced the 200,000th new mini. As he got out of the car he said: "I didn't stall it once. It's very interesting with the left-hand drive." Shift manager Mick White said: "The Prince asked me where the clutch was so I'm not sure whether he drives very often. "It was very good to see him trying out the car, though." Another employee said: "We had been told there was absolutely no way he was going to get in one of the Minis so it was quite a surprise to see him driving off in one." The Prince also met representatives from the Prince's Trust charity office in Oxford and opened a new research centre. The centre, owned by mental health charity Sane, will conduct research into schizophrenia and manic depression at Warnefield Hospital, Oxford. Finally he visited the Wychwood project in West Oxfordshire, where local people have helped restore parts of the ancient Wychwood Forest. The Prince visited an area of recently replanted woodland to unveil a plaque and meet schoolchildren.